"There's something real down here. People are more in touch with the earth and more in touch with each other," says Cajun and lifelong Louisiana resident Elaine Clement. 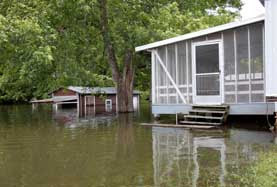 Louisiana's Atchafalaya Swamp is at the heart of the Great Flood Disaster of 2011. As homes become flooded and the Mississippi River swells to levels that haven't been observed in decades, all attention turns to the so-called Cajun Country. Cajun Country is an area steeped in mystery and magic. Mornings dawn in the swamp with a thick coating of mist on the water. The only sounds you can hear are fish jumping and the occasional hum of a boat engine. It's one of the ultimate places you can reach for isolation and closeness with nature. But now, due to rising flood waters, this way of life could disappear. "It's just ... different than the rest of the United States," says Clement. Clement, who grew up in Morgan City and now lives in Lafayette, would know. She has spent most of her life studying the Cajun culture and educating people about it. To her, the survival of the culture comes down to the astounding resiliency of its people. They live every day with the powerful forces of nature and weather. "We've had hurricanes the past 5 or 6 years, the oil spill last year, now this. There are some places people are starting to leave, but still... it's our home." Last week, the Army Corps of Engineers was faced with a heart-wrenching decision. It either could save Louisiana's biggest cities or sacrifice one of its greatest treasures: the swamp. In the end, the cities won. 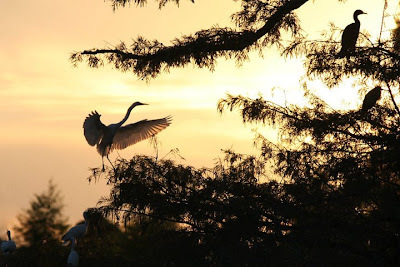 Few know much about the Atchafalaya, which sustains a life cycle both unique and necessary. 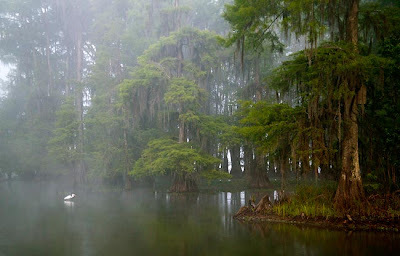 For those who've visited, and certainly for those who live there, the Atchafalaya is mystical. "I fell in love with the area and people right away. They make you feel instantly at home and like family," said Howard Sappington of The Weather Channel. Sappington traveled to the Atchafalaya Swamp with Jim Cantore to film an episode of "Cantore Stories." "There’s something magical about being out on the Atchafalaya with the sun setting through those magnificent cypress trees," says Sappington. Some people live deep in the swamp on houseboats or camps set up on stilts. 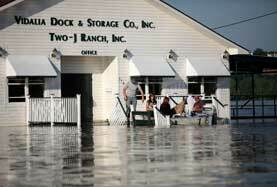 Others live in the small cities and communities that have popped up on the dry land. They're in a constant battle with the water: building levees, filling sandbags, and hoping to hold back the water. The Atchafalaya is the heartbeat of Cajun society in America. Many people still speak French and they have a patois all of their own. "They are warm, funny, outdoorsy people that love life and welcome strangers like family," says Sappington. "They are proud of their heritage, food and culture. Almost all of these Cajuns 45 years or older speak fluent French. They like to tell jokes and love for visitors to experience their culture, including their lovable alligators." Still others head to the Atchafalaya to drop out of society, preferring the mist-covered waters to the daily interaction with people. "You've got the world here in some ways," says Elaine Clement. "We share each other's cultures. Cajun, French, Quebecois, African, Belgian. It's unique from the rest of America." It's because of weather, and floods in particular, that the Atchafalaya Swamp and Cajun culture have been able to grow and thrive. "The reason South Louisiana exists is because of the flooding of the Mississippi River," says Clement. "The levees were put there because of the flooding. That deposited silt and eventually created land that people built their homes and cities on. The flooding essentially built this area. Now with the levees, the oil drilling, the hurricanes, it's hard." Now, as the floodwaters continue to filter downstream at record levels, residents are really concerned about the strength of the levees. Many of these levees were built by cities, subdivisions and neighbors who are simply trying to fight the powerful force of nature. The only thing keeping the Mississippi River from invading their homes is a dirt dam. "That's the biggest problem right now. 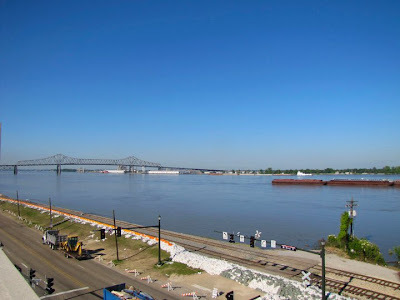 Will the levees hold? It's kind of a test. This is supposedly an historic flood," says Clement. As the relentless onslaught of the floods continues, it's more than just a swamp that's threatened. One of the many unique cultures that make America a melting pot is in danger. "We are people that are very conditioned to picking up and moving on," explains Clement. "We thrive in a crisis. It struck me, too, that even during the hurricanes, nobody stayed in the shelters. That's because we took people in. We take of each other." Why do they stay there when the constant battle with nature seems, ultimately, a losing fight? "It's home. We love where we live. Does it make it easy? No. But we keep on." I read this paragraph completely regarding the comparison of most recent and previous technologies, it's remarkable article. I am experiencing issues with your RSS. I don't understand why I cannot subscribe to it. Is there anybody else getting identical RSS problems? Anyone who knows the solution can you kindly respond? Thanks!! this website, this blog is in fact remarkable. for the reason that this point in time i am reading this enormous informative article here at my house. Studying this information So i'm glad to express that I have a very excellent uncanny feeling I found out just what I needed. I most definitely will make sure to don?t fail to remember this site and give it a glance regularly. thoroughly enjoying your blog. I as well am an aspiring blog blogger but I'm still new to the whole thing. Do you have any points for novice blog writers? I'd certainly appreciate it. valuable knowledge concerning unpredicted emotions. It's actually very complex in this full of activity life to listen news on Television, thus I just use internet for that reason, and obtain the most recent information.